, a famous English astrologer, was born at Diseworth in Leicestershire, in 1602, and was put to school at Ashby-de-la-Zouch, in the same county; but, his father not being in circumstances to give him a liberal education, as he intended at Cambridge, he was obliged to quit the school, after learning writing and arithmetic. Being then, as his biographers inform us, of a forward temper, and endued with shrewd wit, he resolved to push his fortune in London, where he arrived in 1620; and where his immediate necessities obliged him to article himself as a servant to a mantua-maker, in the parish of St. Clement Danes. In 1624, he was assistant to a tradesman in the Strand; who, not being able to write, employed him (among other domestic offices) as his book-keeper. He had not been above three years in this place, when, his master dying, he addressed and married his mistress, with a fortune of 1000l. In 1632, he turned his mind to astrology; and applied to one Evans, a worthless Welsh clergyman, who, after practising that craft many years in Leicestershire, had come to London, and, at this time, resided in Gunpowder-alley. 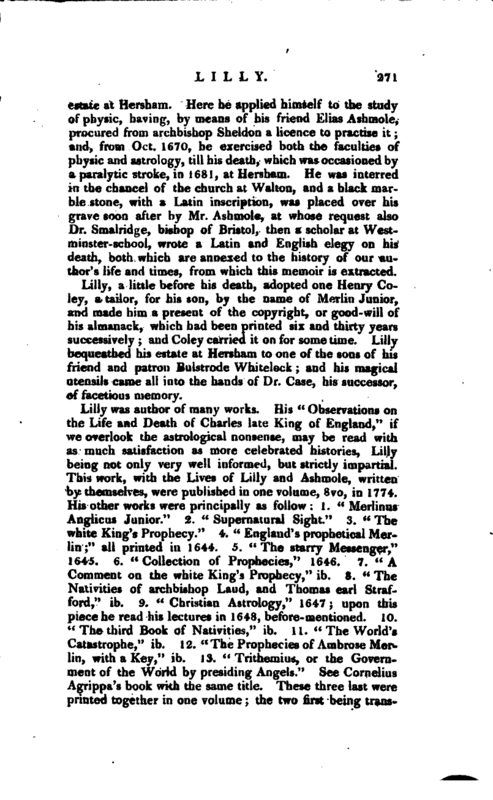 Here Lilly became his pupil, and made such a quick progress, that he understood, in the cant of his brethren, how “to set a figure” perfectly in seven or eight weeks; and, continuing his application with the utmost assiduity, gave the public a specimen of his attainments and skill, by intimating that the king had chosen an unlucky horoscope for the coronation in Scotland, 1633. In 1634, having procured a manuscript, with some alterations, of the “Ars Notoria” of Cornelius Agrippa, he became so infatuated by the doctrine of the magical circle, and the invocation of spirits, as not only to make use of a form of prayer prescribed there to the angel Salmonaeus, and to fancy himself a favourite of great power and interest with that uncreated phantom, but even to claim a knowledge of, and a familiar acquaintance with, the | partieular guardian angels of England, by name Salmael and Malchidael. After this he treated the more common mystery of recovering stolen goods, &c. with great contempt, claiming a supernatural sight, and the gift of prophetical predictions, and seems to have known well how to profit by the credulity of the times. Such indeed was his fame, as to produce the following notable story. When one Ramsay, the king’s clock maker, being informed that there was a great treasure buried in the cloister of Westminster-abbey, obtained the dean’s (Dr. Williams, bishop of Lincoln), leave to search for it with the divining or Mosaical* rods, he applied to Lilly for his assistance. 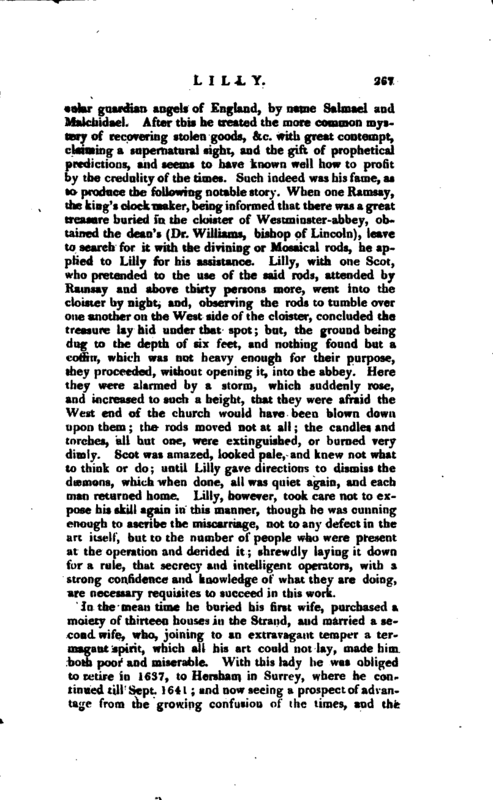 Lilly, with one Scot, who pretended to the use of the said rods, attended by Ramsay and above thirty persons more, went into the cloister by night, and, observing the rods to tumble over one another on the West side of the cloister, concluded the treasure lay hid under that spot; but, the ground being‘ dug to the depth of six feet, and nothing found but a coffin, which was not heavy enough for their purpose, they proceeded, without opening it, into the abbey. Here they were alarmed by a storm, which suddenly rose, and increased to such a height, that they were afraid the West end of the church would have been blown down upon them; the rods moved not at all; the candles and torches, all but one, were extinguished, or burned very dimly. Scot was amazed, looked pale, and knew not what to think or do; until Lilly gave directions to dismiss the chcinons, which when done, all was quiet again, and each man returned home. 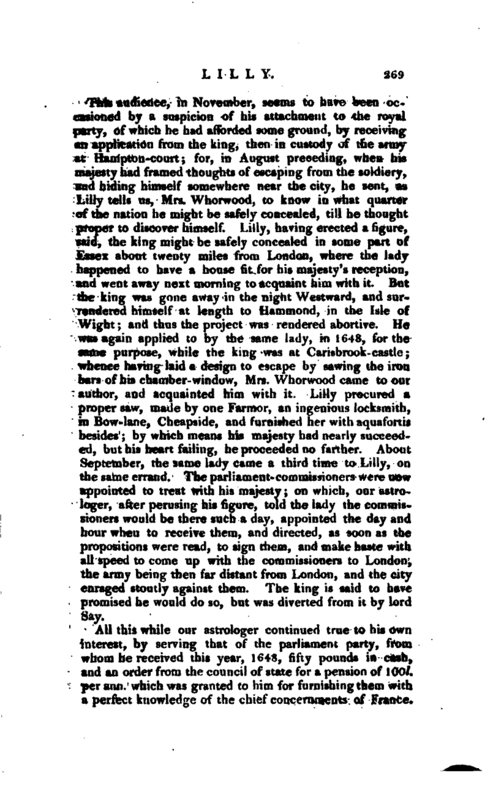 Lilly, however, took care not to expose his skill again in this manner, though he was cunning enough to ascribe the miscarriage, not to any defect in the art itself, but to the number of people who were present at the operation and derided it; shrewdly laying it down for a rule, that secrecy and intelligent operators, with a strong confidence and knowledge of what they are doing, are necessary requisites to succeed in this work. In the mean time he buried his first wife, purchased a moiety of thirteen houses in the Strand, and married a second wife, who, joining to an extravagant temper a termagant spirit, which all his art could not lay, made him both poor and miserable. With this lady he was obliged to retire in 1637, to Hersham in Surrey, where he continued till Sept. 1641; and now seeing a prospect of advantage from the growing confusion of the times, and the | prevalence of enthusiasm and credulity of all kinds, he returned to London. Here having purchased several curious books in his art, which were found in pulling down the house of another astrologer, he perused them with incessant diligence, and, in 1644, published his “Merlinus Anglicus Junior,” and several other astrological books. He had contracted an intimacy, the preceding year, with Bulstrode Whitelocke, esq. who was afterwards his friend and patron; and, in 1645, devoted himself entirely to the interests of the parliament, after the battle of Naseby, though he had before rather inclined to the king’s party. In 1647, upon the breaking out of the quarrel between the parliament and army, whose head quarters were at Windsor, he was sent for, together with Booker, another astrologer, by Fairfax, the general, who addressed him in these terms: “That God had blessed the army with many signal victories, and yet their work was not finished; that he hoped God would go along with them, until this work was done; that they sought not themselves, but the welfare and tranquillity of the good people, and the whole nation; and, for that end, were resolved to sacrifice both their own lives and fortunes; that he hoped the art, which they (Lilly and Booker) studied, was lawful and agreeable to God’s word; that he understood it not, but did not doubt they both feared God, and therefore had a good opinion of them.” To this speech Lilly returned the following answer: “My lord, I am glad to see you here at this time: certainly both the people of God, and all others of this nation, are very sensible of God’s mercy, love, and favour unto them, in directing fhe parliament to nominate and elect you general of their armies, a person so religious, so valiant. The several unexpected victories obtained under your excellency’s conduct will eternize the same unto all posterity. We are confident of God’s going along with you and your army, until the great work, for which he ordained you both, is fully perfected; which we hope will be the conquering and subversion of yours and the parliament’s enemies; and then a quiet settlement, and firm peace over all the nation, unto God’s glory, and full satisfaction of tender consciences. Sir, as for ourselves, we trust in God, and, as Christians, believe in him; we do not study any art, but what is lawful and consonant to the scriptures, fathers, and antiquity! 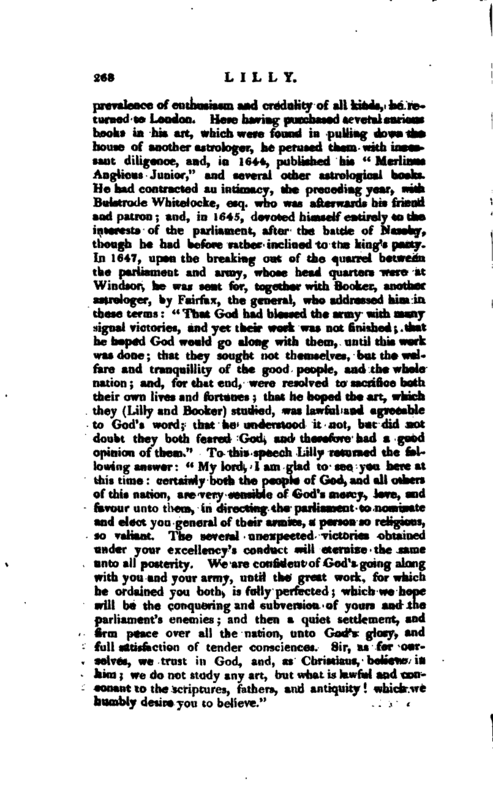 which we humbly desire you to believe.” | This audience, in November, seems to have been occasioned by a suspicion of his attachment to the royal party, of which he had afforded some ground, by receiving an application from the king, then in custody of the army at Hampton-court; for, in August preceding, when hi* majesty had framed thoughts of escaping from the soldiery, and hiding himself somewhere near the city, he sent, as Lilly tells us, Mrs. Whorwood, to know in what quarter of the nation he might be safely concealed, till he thought proper to discover himself. 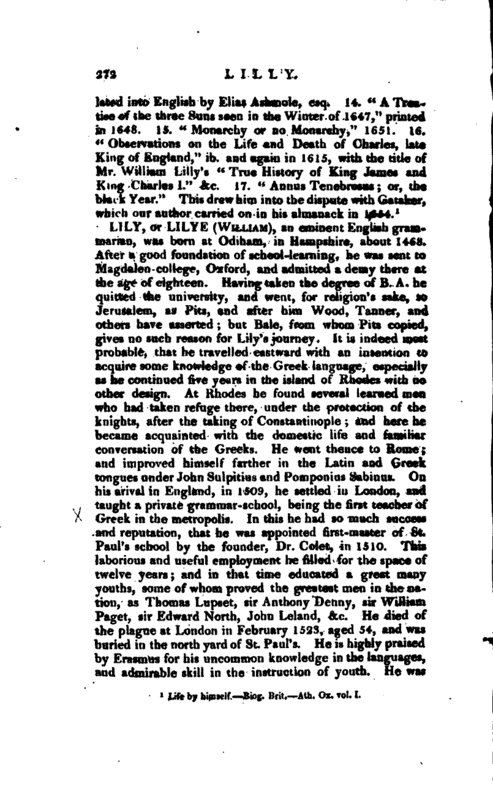 Lilly, having erected a figure, said, the king might be safely concealed in some part of Essex about twenty miles from London, where the lady happened to have a house fit for his majesty’s reception, and went away next morning to acquaint him with it. But the king was gone away in the night Westward, and surrendered himself at length to Hammond, in the Isle of Wight; and thus the project was rendered abortive. He was again applied to by the same lady, in 1648, for the same purpose, while the king was at Carisbrook- castle; whence having laid a design to escape by sawing the iron bars of his chamber-window, Mrs. Whorwood came to our author, and acquainted him with it. Lilly procured a proper saw, made by one Farmor, an ingenious locksmith, in Bow-lane, Cheapside, and furnished her with aquafortis besides; by which means his majesty had nearly succeeded, but his heart failing, he proceeded no farther. About September, the same lady came a third time to Lilly, on the same errand. The parliament-commissioners were now appointed to treat with his majesty; on which, our astrologer, after perusing his figure, told the lady the commissioners would be there such a day, appointed the day and hour when to receive them, and directed, as soon as the propositions were read, to sign them, and make haste with all speed to come up with the commissioners to London, the army being then far distant from London, and the city enraged stoutly against them. The king is said to have promised he would do so, but was diverted from it by lord Say. All this while our astrologer continued true to his own interest, by serving that of the parliament party, from whom he received this year, 1648, fifty pounds in cash, and an order from the council of state for a pension of 100l. perann. which was granted to him for furnishing them with a perfect knowledge of the chief concernments of France. | This he obtained by means of a secular priest, with whom he had been formerly acquainted, and who now was confessor to one of the French secretaries. Lilly received the pension two years, when he threw it up, with the employment, in disgust on some account or other. He read public lectures upon astrology, in 1648 and 1649, for the improvement of young students in that art and succeeded so well both as a practitioner and teacher, that we find him, in 1651 and 1652, laying out near 2000l. for lands and a house at Hersham. During the siege of Colchester, he and Booker were sent for thither, to encourage the soldiers, which they did by assuring them that the town would soon be taken, which proved true, and was perhaps not difficult to be foreseen. In 1650 he published that the parliament should not continue, but a new government arise, agreeably thereto; and in the almanack for 1653, he also asserted, that the parliament stood upon a ticklish foundation, and that the commonalty and soldiery would join together against them. On this he was called before the committee of plundered ministers; but, receiving notice before the arrival of the messenger, he applied to speaker Lenthal, always his friend, who pointed out the offensive passages, which he immediately altered; and attended the committee next morning with six copies printed, which six alone he acknowledged to be his. By this trick he escaped after having been only detained thirteen days in custody of the serjeant at arms. 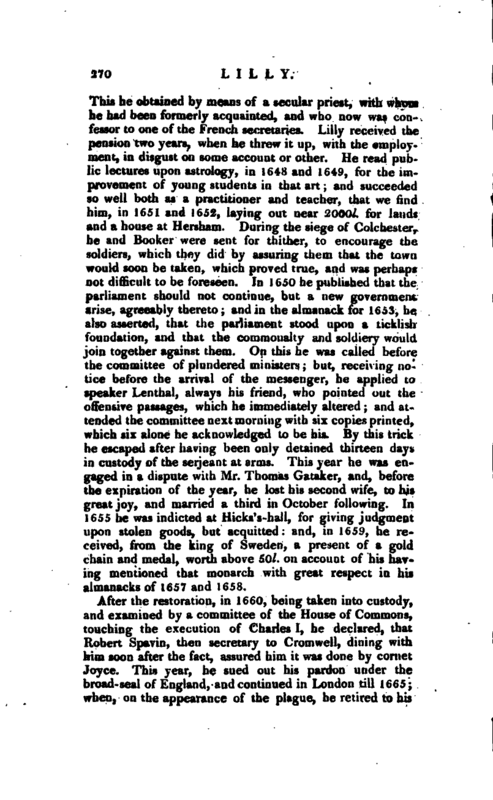 This year he was engaged in a dispute with Mr. Thomas Gataker, and, before the expiration of the year, he lost his second wife, to his great joy, and married a third in October following. In 1655 he was indicted at Hicks’s-hall, for giving judgment upon stolen goods, but acquitted: and, in 1659, he received, from the king of Sweden, a present of a gold chain and medal, worth above 50l. 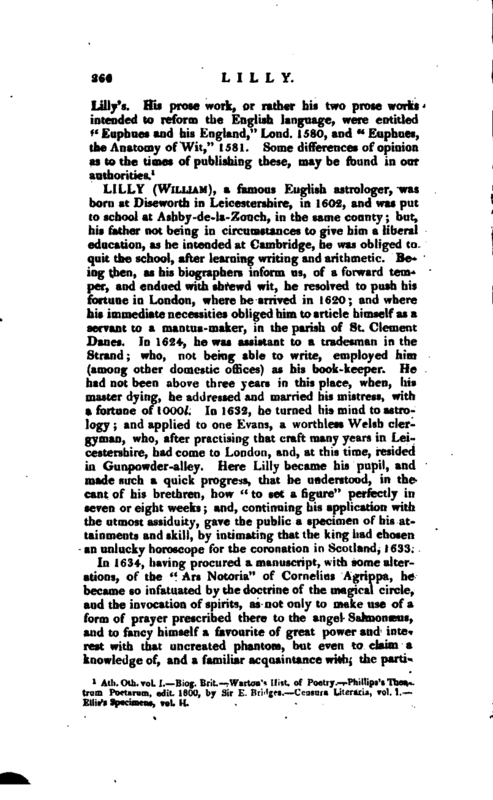 on account of his having mentioned that monarch with great respect in his almanacks of 1657 and 1658. After the restoration, in 1660, being taken into custody, and examined by a committee of the House of Commons, touching the execution of Charles I, he declared, that Robert Spavin, then secretary to Cromwell, dining with him soon after the fact, assured him it was done by cornet Joyce. This year, he sued out his pardon under the broad-seal of England, and continued in London till 1665; when, on the appearance of the plague, he retired to his | estate at Hersham. Here he applied himself to the study of physic, having, by means of his friend Elias Ashmole, procured from archbishop Sheldon a licence to practise it; and, from Oct. 1670, he exercised both the faculties of physic and astrology, till his death, which was occasioned by a paralytic stroke, in 1681, at Hersham. He was interred in the chancel of the church at Walton, and a black marble stone, with a Latin inscription, was placed over his grave soon after by Mr. Ashmole, at whose request also Dr. Smalridge, bishop of Bristol, then a scholar at Westminster-school, wrote a Latin and English elegy on his death, both which are annexed to the history of our author’s life and times, from which this memoir is extracted. Lilly, a little before his death, adopted one Henry Coley, a tailor, for his son, by the name of Merlin Junior, and made him a present of the copyright, or good-will of his almanack, which had been printed six and thirty years successively; and Coley carried it on for some time. Lilly bequeathed his estate at Hersham to one of the sons of his friend and patron Bulstrode Whitelock; and his magical utensils came all into the hands of Dr. Case, his successor, of facetious memory. 1 Life by himself. Biof. L’rit. Atb. Ox. vol. I.